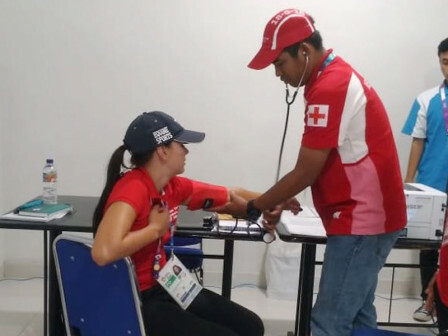 136 medical personnel are prepared in seven Asian Games venues located in East Jakarta. Before assisting on the field, they have been trained by Health Ministry and INASGOC regarding medical treatment needed for athletes, officials, and visitors.
" Previously, they have been given special training by Health Ministry and INASGOC in November 2017 and March 2018"
"Previously, they have been given special training by Health Ministry and INASGOC in November 2017 and March 2018," mentioned Iwan Kurniawan, East Jakarta Health Sub-dept. Head, Friday (8/24). This medical team consists of 33 doctors, 66 nurses, and two food safety personnel. They are deployed to GOR Popki Cibubur, Teater Garuda TMII, Jakarta Equestrian International Park, Pulomas International BMX Center, Jakarta International Velodrome, Rawamangun Baseball Field and Padepokan Pencak Silat. Not only medical team, his side also provides 14 ambulance cars. All of these instruments are used to provide medical services and also to anticipate if anyone needs medical treatment. "But actually, our health personnel's task is not only assisting in the venue, but also the surrounding area that needs medical services," he explained. For example by doing fogging near equestrian venue, checking up food catering from its production site until it is served to athletes, officials, and ot hers.